The Ahwahnee Hills Regional Park is a 400-acre nature park in the community of Ahwahnee on Highway 49 in Madera County. It serves as a natural oak habitat resource for recreation and education for Madera County and the surrounding counties. The park land is owned by Madera County, but the day-to-day operation, maintenance, and improvements are the responsibility of the Friends of Ahwahnee Hills Regional Park, a non-profit organization formed for this purpose. The Friends is an all-volunteer group that solicits your donation of time or money to help this park provide its many benefits to the public in the future. Entrance to the park is free for individuals, but a fee is required to reserve space or conduct events. When staffing levels permit, the park will be open daily from 8:00 a.m. until dusk Wednesday through Sunday, with pedestrian access Mondays and Tuesdays via the Wasuma gate. A park host will be in residence or volunteer docents will be on duty at most times when the park is open to the public. Please note: Dogs must be kept leashed at all times, per Madera County ordinance. Violators will be ticketed. What are the park's operating hours? How can I reserve areas of the park for private events? What are the park policies on pets, horses, bicycles, and skateboards? Are fishing, boating, or swimming allowed in the lake? What kinds of wildlife and plants can be found in the park? What areas of the park are wheelchair accessible? How can I help keep the park open and running? How can I contact park officials? 8 a.m. until dusk, Wednesday through Sunday. In addition, pedestrians can enter the park Mondays and Tuesdays via the south gate (adjacent to Wasuma Elementary School). The Oak Acorn Center is open Wednesday through Saturday from 10 a.m. until 5 p.m., with availability Sundays and evenings by appointment only. Entrance is free for individuals, but there are fees to reserve areas of the park for special events. See the reservations page for details. 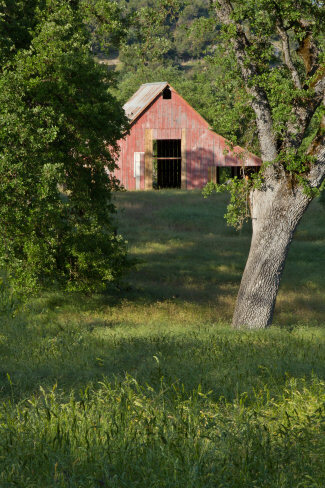 The park is located in the Sierra foothills of central California along Highway 49. It's at the north end of Ahwahnee next to Wasuma Elementary School, roughly 5 miles northwest of Oakhurst, 20 miles southeast of Mariposa, and 22 miles outside Yosemite's south entrance. See the map page for more details. 400 acres of oak woodland; a 15-acre lake; 7 miles of walking/hiking trails (1 mile wheelchair-accessible) and 6 miles of equestrian trail; picnic areas; restrooms; interpretive and study centers. See the activities page and the map page for more information. No pets, other than dogs, are permitted in the park. Dogs must be kept leashed at all times, and owners are requested to clean up and remove solid waste. Horse travel is limited to the marked equestrian trails. Bicycle and skateboard use are not allowed in the park. Boats and swimming are not allowed. Fishing is temporarily prohibited due to drought conditions. Parking at the lake (with an exception for handicapped guests) is prohibited; guests must park in the main parking area. Hundreds of species are native to the area; see the flora & fauna page for details. The Interpretive and Oak Acorn Centers are AMA compliant. The walking trail is unpaved, but much of it is hardened and should be navigable by wheelchairs. There are lots of ways to help the park; see the volunteering page for details. If you'd like to donate to the park, click the button below. The Friends of Ahwahnee Hills Regional Park is a 501(c)(3) organization and donations are tax deductible. See the contact page for various ways to reach us. In case of emergency, first call the Park Host at 559-676-2728.